A senior portrait is one of those milestone portraits in life. The next portrait a high school senior will appear in will likely be a wedding portrait. Think back on your life. There are those newborn pictures (with the cute little scrunched up faces), early childhood portraits, the year-to-year school portraits (which can’t be too original due to the sheer volume of them), and finally, the high school senior portrait. Often, it’s the high school senior portrait that ends up on a parent’s wall for years. So, how do you go about choosing a high school senior portrait photographer? First, do some Google or other searches for “high school senior portrait” or “high school senior photography” along with the town/city you live in. Then check out the photographer’s website. Do you like their style? Look at their entire body of work. Do people look natural? Do they look relaxed? Next, find out if the photographer is someone you would want to work with. Do not underestimate this. The photographer has the power to help make you feel at ease or to make you nervous and feel awkward. E-mail and/or call the photographer to establish a dialogue. Does he seem flexible? Friendly? Knowledgeable? Does he communicate well? This is important so you can be sure to get what you want. Ask the photographer for suggestions regarding clothing, colors, and make-up if that is applicable. Another consideration might be price. The bottom line is that, like a lot of things in life, you get what you pay for. Ask if there is a sitting fee and how much time the fee includes. Ask if there are any specials for high school seniors. Some photographers take the photos and give you a CD on the spot. Are you a Photoshop expert? If not, I would not recommend this. A lot of the work a photographer does is Photoshop work. Often, the post-processing (Photoshop work) can make or break the photograph. Plus, professional photographers have access to professional quality printing and mounting services to mount your larger photographs on high quality material. So where ever do you begin? • Will you be interested in a coffee table book which captures all the best photographs? • Do you want studio portraits, on-location portraits or a combination of both? If on-location, do you get to choose a rain date? • Are you interested in a wall portrait? • Do you want an on-line meeting so that other family members can view/purchase your photos? • Do you want Black & White portraits, sepia toned, color, or a combination? • Do you want to bring a band or orchestra instrument? A guitar? Wear your sports uniform? Bring a pet? • Does the photographer allow other people to be in the pictures? For example, I recently had an extended senior shoot with the entire family in some of the photographs. 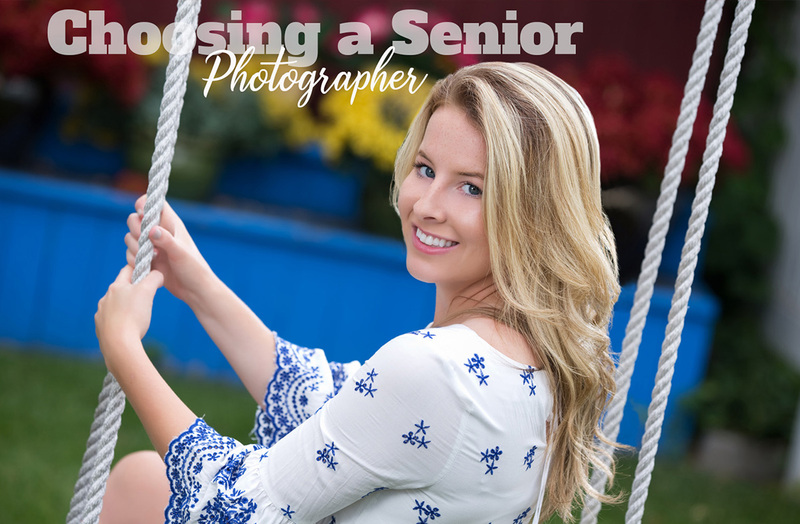 Yes, there are a lot of things to consider when choosing a high school senior photographer. Ask your friends for a recommendation or look on lists such as “Best of” in your area or Angie’s List. It’s a special time in a senior’s life. I wish you the best in your search and would love to hear from you. Please e-mail me or call anytime at 570-344-7053 or studio@richbanick.com.